breakfast | What's Cookin' Good Lookin'? I may be in my thirties, but I want to be Nigella Lawson when I grow up. I am particularly fond of her unique brand of pretentious unpretentious-ness, her confidence in admitting her laziness in the kitchen (you know what, I don’t want to stress in my happy place, either! ), a fear of sounding too bossy (I like that, as I always tweak recipes), and preference for accessible and affordable ingredients and methods. Basically, she speaks to me as a busy person who cooks as a hobby, but who really sometimes just can’t be bothered. And then there are weekends like this one, where I just want to cook all.the.things. I unsuccessfully attempted to satiate my cooking-craving by simply reading cookbooks, and I was astounded to realise that I hadn’t cooked a thing from my copy of Nigella’s At My Table. Criminal, really. 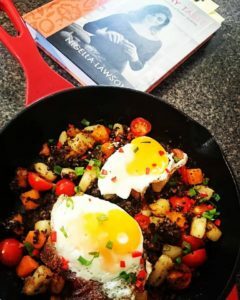 So when I found the recipe for Black Pudding Hash with Fried Egg, well, I knew what my Sunday morning would look like. But it had to start with a run. Between the potatoes in the hash and the oats in the pudding, this sucker is all carbs and at least as twice as many calories than I’d usually consume at breakfast, but it’s filling as could be, and you know what, sometimes you need to feed the soul as much as the body. 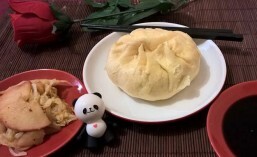 I found it works itself out in the long run, as a light lunch is in order after such a heavy breakfast, anyway. As always, I changed things up to make the recipe work for me. It’s very similar, but I just couldn’t see the need for doubling the oil or black pudding that I usedI love Nigella, but I will never understand how she eats the way she claims, and still manages to look as she does! I also was concerned that it might be a little dry, so I threw in a punnet of halved cherry tomatoes towards the end, allowing them to collapse and created a bit of a sauce that was simply divine. The addition of sweet potato was purely because I have too many in my cupboard right now, but it did make for a prettier dish. As it stands here, my version comes in at a slightly indulgent 484 calories. If you’re not so worried about the calories, I would bet the farm that a piece of olive-oil-smeared sourdough would just take this whole dish to heaven. But I didn’t tell you that! Heat oil in a heavy-based frypan (a cast iron skillet is perfect) on high heat. Fry potato and sweet potato, stirring occasionally for 5 minutes, until coloured and starting to soften. Gently pour water over the potatoes (this is dramatic, noisy, and may set off your smoke detector, but it’s kind of fun), and add a good grinding of salt and pepper. Turn the heat down to medium-low and cook the potatoes for another 10 minutes or so, stirring occasionally to avoid them sticking to the pan. Add the black pudding and cook for 3 minutes or until heated through. In a separate pan, cook fry 2 eggs to your liking. I like a runny egg, so I crack it onto a pan over low heat and let it do its thing until the white is cooked through. All the better if the bottom goes crispy! Meanwhile, tumble tomatoes into the hash, and allow to cook without stirring, while the eggs cook. Give the hash one good stir to combine, and divide into two bowls. Top with egg, and sprinkle with spring onion and chilli.